My aunt emailed me with the information that Grocery Outlet was selling 5 dozen medium-sized eggs for $2.99. I hustled right down there and got them. I know that in other parts of the country eggs have been super low-priced, but 99c/dozen is about the lowest we have seen in this part of the country, so I was delighted for 60c/dozen. They weren’t even as small as I expected–pretty good size for medium. It seems that I have had to go to the store way too often this month. Last month, when I challenged myself to use things up, I guess I did a really good job! Every time I turn around, someone is letting me know that another thing is gone! A lot of what I’ve needed to get has been non-food items, such as hair products, razors, deodorant, dish and laundry soap, school supplies, etc. So, I’ve tried to use downloaded coupons, paper coupons, sales, etc. as much as possible. I’ve also re-stocked the food items I was out of and continued canning and using produce from the garden and what was gifted to me from my sister’s garden. I remembered to download my Friday Freebie yesterday from Fred Meyers, and also picked up more Tillamook cheese from there–at $4.99/2 lb loaf. This week, I have purchased 2 cheddar and 2 pepper jack bricks. I grabbed 2 cauliflowers from the reduced produce rack, for $1/head. I had a coupon for $4/off 3 Enjoy Life products. I found some gf cookies on the reduced rack for $2.07/box. I bought 3 of them, bringing my total, after coupon, to $2.21 for 3 boxes of gf cookies. I grabbed several bread items from the reduced rack for 59c/loaf, 99c/bag of bagels, English muffins and hot dog buns for 59c–I got so many that every empty corner of the freezers are now full of bread items! I found 1/2 gallons of milk for 87c, And so on. I’ve worked pretty hard at getting my pantry in order, and just have a few more things to round up and I will be done for a while again. Fall is definitely on its way. I’ve seen a few trees beginning to change colors around here. 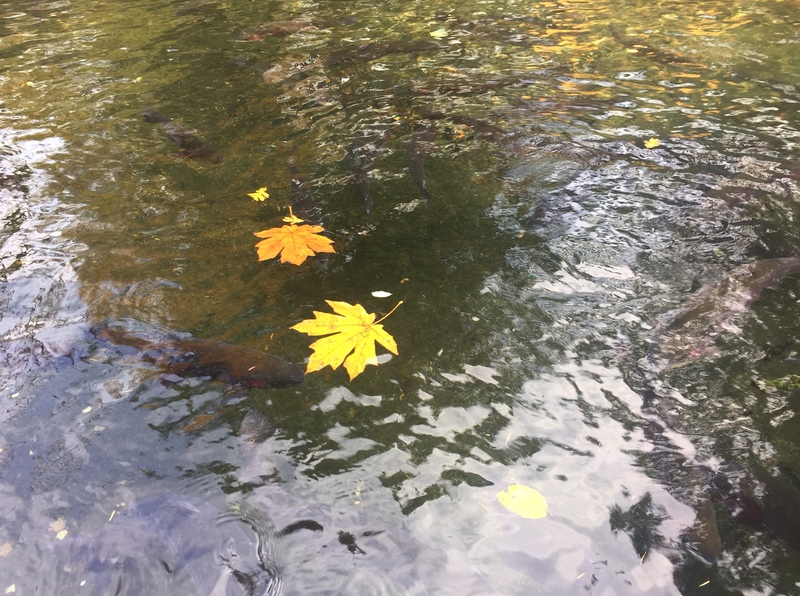 This picture is from last fall, when we took the kids to Bonneville Dam and Multnomah Falls, up the Columbia River Gorge. Our first soaking rain of the year is predicted for tonight and it is supposed to rain for a few days. I’m ready. The smoke was pretty bad yesterday from all the wildfires that still burn in the forests of Oregon. I’m delighted to think that there may be some relief once the rains come, and am also glad many of the historic sites in the gorge were saved from burning. All week, we scurried around like crazy doing all we could to prepare, and spent many hours yesterday on fall chores. Every day for the past couple of weeks, I’ve had each girl pull one bucket of weeds from the yard. I’ve been pretty easy on them in letting them choose any size bucket, and sometimes they choose the littlest bucket you have ever seen, but the yard is starting to look way better! Rob and I mowed the lawn one evening after work, and we’ve been clipping off branches that are in the way, or need pruning. We’ve been trying to fill the yard debris bin each week. Patsy and I worked on the garden and went to the store. 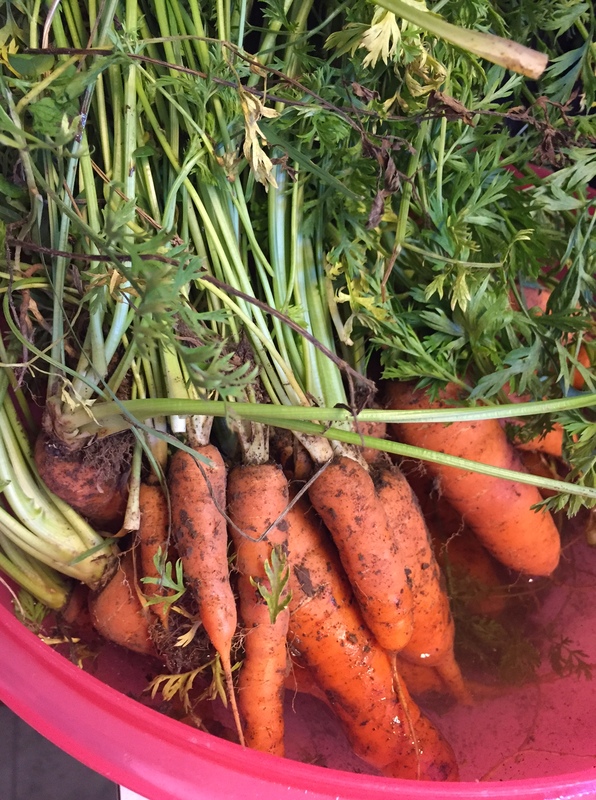 I am planning a garden update post for later in the week, so I won’t spend much time on that now, but one thing she did was pull and wash all the carrots. She snapped off the tops and put them in Ziplocks. They are now in the camper fridge with many other items, like eggs and cheese, and will keep a long time. It’s not large, but it sure helps since we still only have the 1 fridge. Rob and the older girls went for the remaining wood that was up at my sister’s place. 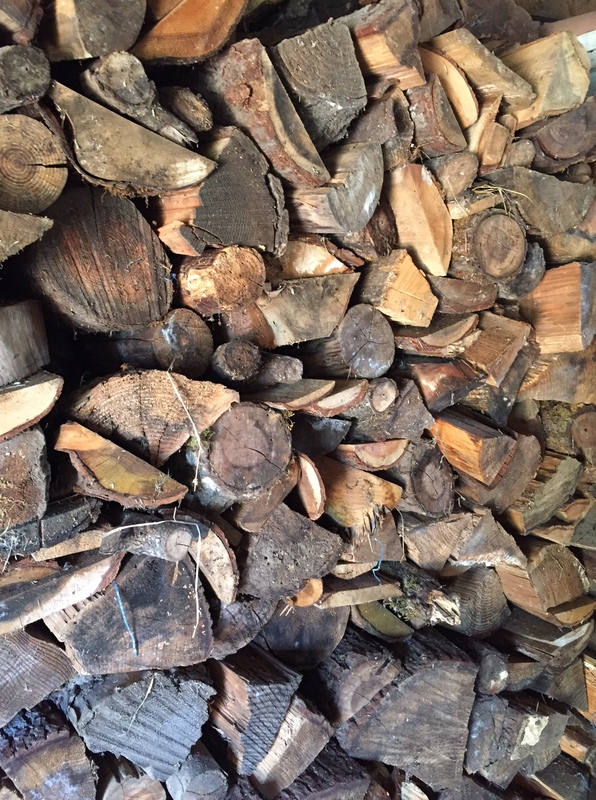 There was some cutting and splitting to do this week, so it took them most of the morning for 1 load, but we all worked to get it stacked once they returned, and that job is done for now. Once that was done, Rob and Lovana took our old broken refrigerator and a bunch of recyclables to the dump. It has been bothering him for quite a while, since it was sitting out there by the shop, and he wanted to get it gone while it way dry! He had to pay $25 to get rid of the fridge, but the rest was free. How nice to have that stuff all gone–a whole van full. It’s amazing how many things you find that need cleaning up after so long without rain. We’ve had a couple of small showers of rain, but no soaking rain all summer. Are you ready for fall? I am not finished, but sure feel like I made some progress around here this week. Rob and I set ourselves a goal to do at least one thing each evening after work towards getting things cleaned up before the rain, and we are happy with our progress. Let it pour!!! Now, I’m off to make those Deviled Eggs for our Family Sunday Dinner! (I used an old picture since I have not made them yet!!) The eggs are boiled and cold, and I’ll be done in a jiffy. 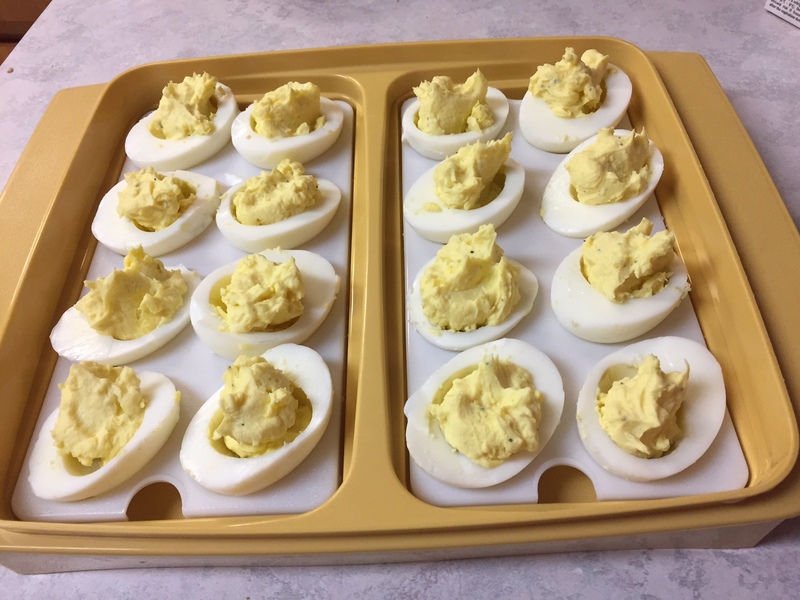 We are celebrating my aunt’s birthday today, and I wanted to make her Deviled Eggs, since she likes them and was so kind as to tip me off about the great sale on eggs:) I’ll pack the food in a cooler, and take it to church with us, since we will be over at my sister’s house today. Her kitchen remodel is finally done and they have been able to come in out of the garage and finally cook after a summer of using a hot plate and microwave! It’s beautiful. I’m excited for them! Too funny about the girls finding the smallest buckets possible! I’ve been thinking about the coming rains as well. Went to the garden on Friday and Saturday to start my Fall cleanup. I don’t have the energy to do much at any one time but I was happy with the results. And I found more green beans and cucumbers hiding!! Love that picture of the deviled eggs — I’m a big Tupperware fan. And great job on finding sales and coupons. I used to dread finding out –mostly at the last minute — when school supplies were gone. I went to the non-profit grocery store this week for $0.10 bread and 1/2 price cookies. My garden is still producing and I’m not having to buy any veggies. What a blessing that is. Take good care. The promised rain came in this afternoon, and I’m feeling very cozy and snug here in the house. I’ve had that Tupperware egg container for years, and I got it from a garage sale in the first place. I have certainly got my money’s worth (all 50c or so). I love how I can put the lid on and nestle the eggs in their little spaces and travel with it. Yesterday, when Patsy helped me shop, she noticed for herself how much we saved with the coupons. I also pointed out how much NOT buying veggies was saving us. It does help so much. I’m glad you are still finding some in your gardens. SJ I am wondering where the non-profit grocery store is in Vancouver, I have family that live there and I am sure they would be happy to find it! I have been trying to stock up , before winter.. I think I am about caught up??? hope so, any way. I will be stocking more Cooking for Holiday items , when those sales start. The eggs were good. We ate all I made, starting with Rob and Patsy eating my leftover few for breakfast, me eating all the really ugly ones:), the family enjoying them for lunch, and my aunt taking the last 4 pieces home for her dinner. I think I made about 2 dozen eggs worth, and was glad we all enjoyed the treat as much as we did! You were able to stock up at very good prices! Sounds like you got a lot done, this week! I, too, paid $25 to have them haul away the old fridge! The city would have picked it up free from the curb, but I wasn’t able to move it to the curb by myself and there wasn’t anyone I could ask to move it for me. I hope you get your rain and it helps with the fires and the smoke. Have a lovely week! I’m glad you are enjoying the old posts. Egg prices are all over the place here. Even though we are still having temperatures in the 80s, there is a feel of fall in the air here,too. I’m so ready for it. I am too! I’m enjoying our first fall-like day so much. I will be ready for a few sunny days when they come again, as they always do in the fall, but I like the cooler weather they come with. We are still cleaning up from Irma. What a mess! Our neighbor boys came and helped for pay on Friday and that has made a big dent. Our $76 mattress arrived and is so nice. On Fridays I enter all of the week’s expenditures in my budget ledger and when I sat down to do it on Friday I had nothing to enter. I guess that just not spending anything is the best way to save! I am so glad you are getting some rain to help with the fires. Praying it puts them out! I love the tiny buckets. KIDS! I’ve never been in a hurricane, but the pictures are horrific. I’m glad you are ok, and that there were some neighbor boys to help with the mess. We are getting gentle rain right now, so welcome to me. I’m feeling rather cozy and relaxed this evening. I’ve got a few things to do to get ready for tomorrow, but I will do them lazily:) I’ve been in the mood for drinking tea, as well, so I’m going to get a cup of that to sip on while I do a little cooking to make tomorrow easier. Since I have long busy Mondays, and get home around 6:30, it makes all the difference to have some food prepped or in the crock pot. The carrots and eggs look delicious! It is 90 degrees here. Wow! I’m ok with 90, only because we usually have pretty low humidity, compared to some places, and the night-time temperatures cool down nicely. I’m guessing you are from the south, Cindy from the South (LOL), so I’m guessing you have a bit more of that hot weather to come. I hope you have air conditioning! It’s really hard for me to sleep at night if I’m too hot. Hahaha. Big buckets. Tiny buckets. Your girls are a dream. I love Deviled Eggs too. Hurray for your sister with a finally completed remodel. I hope you get a nice steady rain that will soak the garden and possibly put out some of the forest fires and skies of ash. Thank you. I’ve thought of you several times this past week and am hoping you are getting back to normal after all the storming!